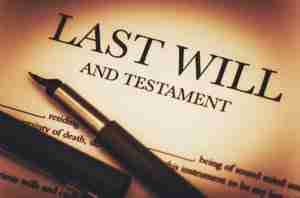 If you die without a will, the disposition of your estate will be divided in a way mandated by the state. For most of us, this is not an ideal situation, but it has a very easy solution. With a will you ensure that you are protecting your family after you pass on. If you die intestate, meaning without will, who gets what will be determined on whether you have living children, parents, spouse, or other close relatives when you die. Just because you do not have a will, it does not mean that everything falls under the intestate law. If you have an insurance policy that names a beneficiary, that beneficiary receives the money as stipulated in that policy. If you have a joint account with your spouse, your spouse will inherit the entirety of that account. If you have other money or property that is not under joint ownership and does not have a named beneficiary, then that property would be passed on under a will. At that point, if there is no will, then the state will outline, based on the law, who gets what percentage of everything covered by the intestate law. If you are grieving the loss of a family member, the last thing you need is the state to come in to divide up the property. It can be extremely stressful, not to mention inequitable depending on individual circumstances, and it can also be against the desires of the person who passed on and the surviving family. Besides the disposition of property and wealth, there may also be children and other dependents. It would be bad if family fought over property and money. If there is no plan as to who will take care of any children or even adult dependents who cannot take care of themselves, then you risk putting the entire family into chaos to figure out how these dependents will be cared for. There is quite literally no reason for any of this to happen. Putting a will together and getting it filed is a relatively easy process. You will have some very big decisions to make regarding family, money, and property. If you have dependents, you may want to consider setting up a trust in their name as well. This will ensure that they have the money they need, but it will be protected and maintained by a responsible party. Elan and his dedicated staff can make sure that you have all the proper documents in place. Do not think that you have all the time in the world to get it done. It can never be too early, but, if you die without the proper documents filed it will be too late. Contact Elan Wurtzel to make sure you and your family are properly protected.